Next happy thing happened yesterday as I browsed through the latest Quilt Sampler. Oh! Ye Olde Schoolhouse is featured. They have bought my patterns! See how I cleverly have directed your eye to my little pattern lol? Karen, I am concerned about your comment about the needle down feature of your new 930. The only way the machine has a needle down is if you press the foot pedal with your heel to drop that needle. It shouldn't be stopping with the needle down otherwise. I would suggest you take it to a Bernina dealer before you use it. It's a wonderful machine! Maybe the timing is off. Woo-Hoo! Congrats on the new-to-you machine and the patterns!! I would really recommend taking the machine in and having it serviced. That is the most reliable way to get things moving smoothly. Hi, Cherie! You are on "no reply" so I cannot reply directly. That is correct, I make the needle go down when I tap the pedal with my heel. Yes, I am just a bit concerned about the heaviness of the handwheel but we have a very good Bernina person in Marietta (GA) so I will get it to him eventually. It's just tough to find the opportunity when the shop is open. Oh, good! (about the needle down thing). Glad you have a Bernina dealer close. I think a good cleaning will probably do wonders. My 930 recently completely froze up (kept thinking I would finish just one more thing and give it a good cleaning/oiling)... Lesson learned. It still doesn't seem completely happy, but it's getting cleaned and oiled much more often! Taking it to a dealer first is a good idea. That said, many years ago, I worked for Pfaff and what they told us was to oil each area that came in contact with a moving part but not if it was an electronic model - I'm not familiar with this particular Bernina. The idea is reduce friction and wear. If it doesn't move, it doesn't have to be oiled. It's kind of hard to explain because you have to turn the hand wheel and look at what moves. And there are often some holes that get oil dropped into them. You may be able to find a manual on-line and that would have the diagram. (If it's not available on-line, I'd order one from the dealer.) If this is a mechanical and not an electronic model, there's no reason you can't clean and oil it yourself and have it good as new. Also, and I'm sure you already know this, clean the area around and under the feed dogs really well and really often. I froze a machine once because I forgot. BAD me! For trouble with the hand wheel, also check the belt. Disclaimer - I am NOT a professional! The 930 is a great machine, and I am sure that you will love it. Happy, happy sewing on your new machine. Isn't it exciting about Ye Olde Schoolhouse? That is one of the few things I miss about Wisconsin. The ladies there are so very wonderful and they have several of your patterns made up and on display. Jeannie sent me an autographed copy of the magazine. LOL I am also part of Aunt Grace's BOM they are offering, just so I still feel connected. 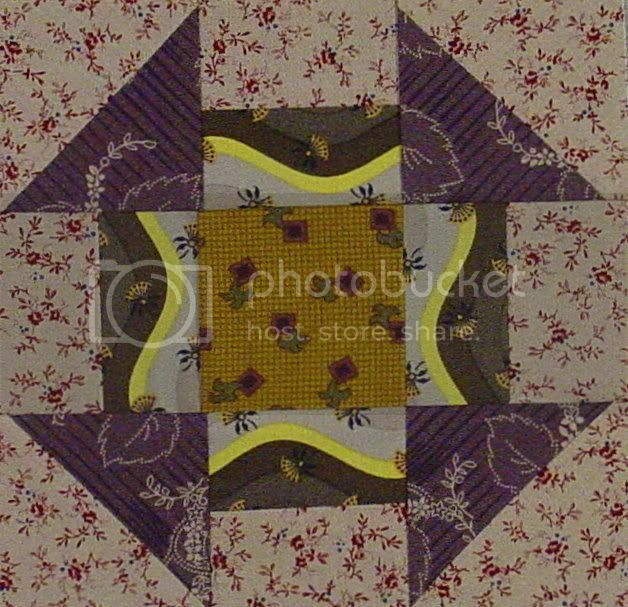 Hey - I am going to explore a few quilt stores this week. Where should I go? Which one are you active in? Tiny Stitches? I need to sign up for a couple of classes just to get out and meet people. How exciting to spot your pattern made up in the magazine!!! You clever woman! What great info for your Bernina. I use my heel for the needle down all the time. It is a wonderful feature. Plus the knee lift. Did you get the lift lever? 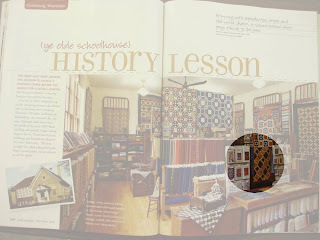 How cool to have your quilt featured so prominently! But better still CONGRATS for being published in a major magazine! Yeah for you . . . . and me, too. Feels like a near brush with fame. I share your joy in finding your Bernina. I bid for a similar one 2 years ago on Ebay, and it has been a delight every day since it arrived. Better than therapy. I wish you many wonderful days sewing with it. You do beautiful work. This is THE BEST Bernina! I bought it new in 1986 and then sold it when I upgraded. One of the worst mistakes I have ever made...regretted it immediately! I was finally able to purchase another one about 3 years ago from my Bernina salesman. Yep, it is THE BEST! Congratulations on your purchase, you won't regret it at all! Have you gotten the machine checked out yet? And is it working beautifully? I hope you're having fun with it.